The San Jose Barracuda fell to the Cleveland Monsters 4-1. 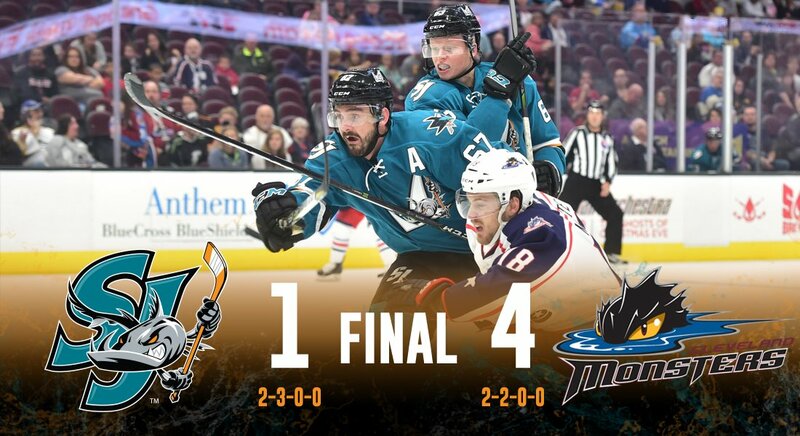 CLEVELAND, OH—The San Jose Barracuda traveled to the Midwest to face the Cleveland Monsters, AHL affiliate of the Columbus Blue Jackets, on Saturday, October 21, where they fell 4-1. Troy Grosenick started in goal for San Jose. The match had a slow start to begin with; 35 seconds into the first period, Cleveland’s Carter Camper effortlessly made his way past the Barracuda’s defense and fired a shot over Grosenick’s shoulder, giving the Monsters a 1-0 lead off the bat. In the second period, the Monsters brought the lead up to 2-0 when John Ramage scored 12:56 minutes in. The Barracuda had sufficient opportunity to score on the power play, which Helewka came close to, but Monsters goaltender Brad Thiessen was clearly in a “hail Mary” mindset and successfully blocked the shot. Bollig notched San Jose’s only goal of the game a few seconds before the two minute mark of the third period. Middleton and Sorensen provided the assists. Cleveland came back when Miles Koules scored a power play goal, followed by Tyler Motte successfully taking advantage of the open net with 53 seconds left in the game. The Barracuda took three penalties in the first period, one during the second, and another three in the third, which Coach Roy Sommer has referred to as “bad decisions.” Grosenick failed to stop three shots out of 21, while Thiessen stopped 18 shots out of 19. The Barracuda are now 2-3 and will face the Monsters again on Sunday, October 22.